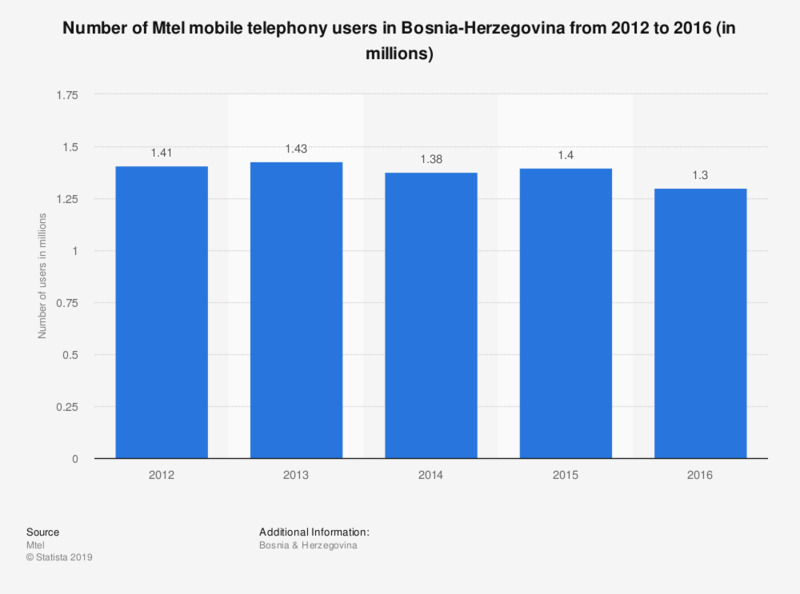 This statistic illustrates the total number of mobile telephony users of Mtel in Bosnia-Herzegovina from 2012 to 2016. The number of mobile telephony subscribers fluctuated during this time period. Comparing the last two years, Mtel lost 100,000 subscribers from 2015 to 2016, going from 1.3 million users in 2015 to 1.4 million users in 2016. Mtel is a telecommunications company located in Bosnia and Herzegovina. Its main activities are in wire, wireless and satellite telecommunications. In the same context, the mobile telephony services provided by Mtel are of many types such as prepaid, postpaid, VPN, M2M and quadro services.